Hetch Hetchy valley is currently partially filled with water. The Raker Act, passed by Congress in 1913, allows San Francisco to dam Hetch Hetchy Valley in Yosemite National Park to provide water to the growing city -- but only on the condition that the dam also generate electric power, which is to be sold by the city to its residents at low rates. (Also included are several other dams in or near Yosemite National Park.) That provision was intended to prevent Pacific Gas and Electric Co. from establishing a private-power monopoly in northern California. Today, PG&E is a private-power monopoly in northern California and rather then providing low cost power to the residents of San Francisco, Hetch Hetchy provides power for SF municipal uses (Muni, SFO, City offices) and is sold to Modesto and Turlock Irrigation Districts, which also had prior rights to Tuolumne River water. So much for following the provisions of the law. Never before or since has such a desecration of a National Park been allowed. There have been various rumblings about removing O'Shaughnessy Dam and restoring the valley so that this scenic wonder could be visited again. Too often all that happens is another study (e.g. 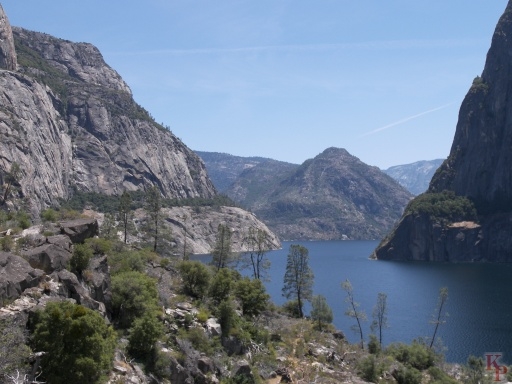 see the 2004 California Hetch Hetchy Resoration Study -- remember the two proven methods to kill a proposal are either to form a committee or to ask for a study. Like many users of our public lands San Francisco pays below market rent for its use of this resource owned by all Americans. San Francisco is no different from mining operations that destroy the environment and leave us (the taxpayer) to pay for the damage or ranchers that over graze public lands and pay little for the privilege. San Francisco built it, San Francisco has made millions from it (all for a $30,000 per year rental, which Congress can increase at any time, but has not done so), San Francisco can remove it. No more studies are needed. 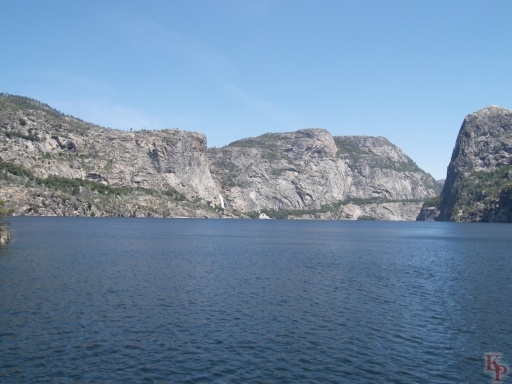 The Sierra Club and others have joined in a campaign under the heading Restore Hetch Hetchy - the second Yosemite!. But that campaign is too much talk and too low key, probably because of the long term reticence of San Francisco centered organizations to really work that hard on something that might cost San Francisco money. The drive to Hetch Hetchy takes you through forested areas with resorts and camps. You get glimpses of the canyon with Wampama Falls, the middle of the three main falls. Tueeulala runs in the spring (much like Sentinel or Ribbon in Yosemite Valley). 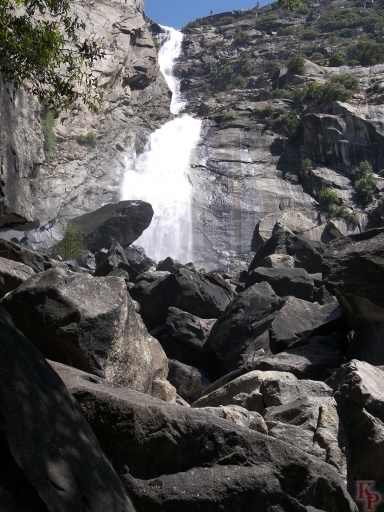 Rancheria Falls is about 6 miles by the trail and is generally the first place to camp. O'Shaughnessy Dam. 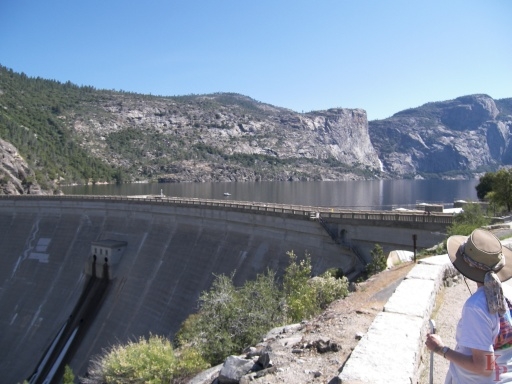 (Sometimes called Hetch Hetchy Dam) In the Hetch Hetchy Valley day use parking (controlled as a national security site, if every city water system had these restrictions, there would be few public lands people could visit), your first view is the dam. The constantly running water fountain in the middle of the dam tastes very strongly of water fountain, don't bother unless you need to wash your hands or face after lunch. O'Shaughnessy Dam was originally completed in 1923 with the height increased in 1938. Hetch Hetchy Valley, from the dam (3813'), you get a hint of what could be, imagine it without 300' of water. Hetch Hetchy Dome (6197') lies beyond Wampama Falls, Kolana Rock (5772') is on the right (south). 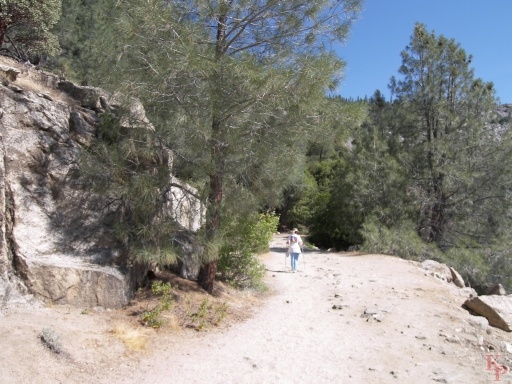 The trail along Hetch Hetchy Reservoir initially follows the scenic road just above the lake (construction of this road or trail was mandated by the Raker act). The sign reminds you that you can only look at the water, you can't touch it in any way. Wampama Falls cascades over 1000' into the lake. The cool mist provides the only respite on the trail, which follows the hotter South facing side of the canyon. 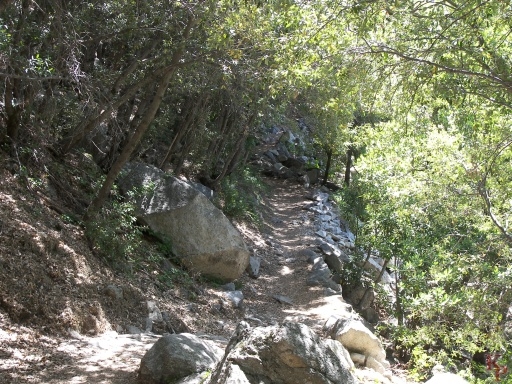 The base is a 5 mile round-trip easy hike. Return to my Yosemite home page.